Dr. Margit Wiesner received a Ph.D. in Developmental Psychology from the Friedrich-Schiller University of Jena, Germany. She is currently Assistant Professor in the Department of Educational Psychology at the University of Houston. She also holds an appointment as Senior Research Scientist in the Center for Drug and Social Policy Research (CDSPR) at the University of Houston. 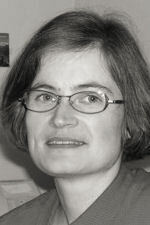 Dr. Margit Wiesner has been co-investigator on various grants from the National Institute of Alcoholism and Alcohol Abuse, Centers for Disease Control and Prevention, and the German National Science Foundation which supported longitudinal research on substance use, delinquency, and other health-risking behaviors among adolescents and young adults. She was principal investigator of a recent pilot study on “Latino Youth and the Future (LYF): A Study of Health-Risking Behaviors” in Texas which was jointly conducted with OSLC scientists (primarily Dr. Deborah Capaldi and Dr. Hyoun Kim) and co-funded by the National Institute on Drug Abuse. She also directs various smaller studies on adolescent victimization and violence exposure in public high schools in the Greater Houston area. Her primary research interests include modeling of developmental pathways of problem behavior (especially juvenile offending behavior, but also depressive symptoms, substance use, and other health-risking behaviors) and associated risk factors and outcomes. Other interests include early adult career pathways, psychosocial transitions during adolescence and young adulthood, and development of adolescents in times of social change.